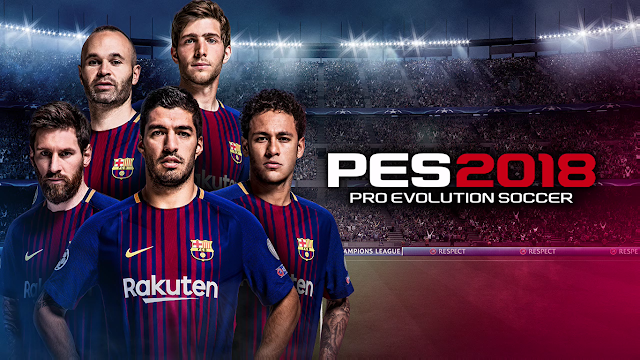 The gaming football (soccer to our American friends) season is upon us, with yet again Konami showing what they have for us first up, with the release of PES 2018 last week. Many reviews have gone up since, with me sitting back until servers went up to at least sample what online felt like before putting fingers to my keyboard. I've said it in the past and still say it now. I'm more of a FIFA guy these days thanks to PES having that slump of poor releases after 06 came out, with FIFA ever since giving me what I need when it comes to my online football career both in offline and online play. The last few PES releases have no doubt started to make long-time FIFA players take notice mind you, with the game stepping things up in some key areas, but never fully making a game that demands the attention of every football fan that likes things a little more official and licenced. Yes, you can edit teams and things in the menu, but your casual game is never going to care about that when the other leading game has it ready to go right out of the box, even if that game tends to not change much from the last as well. While PES 2018 certainly covers most things a football fan could want from a game in 2018, it still lacks in the key areas of both licencing and also dated looking menus, something I've also been saying since getting back into the franchise with the last few games thanks to reviewing them. The menus and options in-game just make the game feel much older than it is, with doing simple things such as changing formation, to things such as transfers in certain modes just not being as exciting or interactive as their main competitor. All the fan favourites are back in the game once again. Master League, Become a Legend, and myClub, with the modes themselves, pretty much playing like I remember it to last time. While Master League is great for the offline player who wants to build up a team, Become a Legend and my Club is where I've spent most of my time. Become a Legend is basically Be a Pro mode from FIFA games with the same deal of starting out as nothing and making something of yourself. myClub is also just FIFA Ultimate Team, with both these offering nothing for me as a player after trying out last year. In myClub you play online and offline matches to earn GP and also myClub coins, with these being the way to get top players on your team if you hope to become half decent when taking on the pros that litter the online areas of this game. Savages the lot of them, I tell ya. The thing with myClub is once again the menus will just confuse the new guy who is dipping into the game for the first time. Scouts here, there, and everywhere don't make it a welcome place for the new guy, with most modes in the game needing you to remember way too many things to just enjoy them. The one place where PES does its talking really well is on the pitch, so it's a shame that yet again the things surrounding it let it down, On the pitch PES plays really well, with games being like a game of chess in which you need to break down your opponent, be that offline or online. In the options, you can turn the speed of games up and down, so if you like a faster match then the option is there to fiddle with it. Scoring may be easy enough on lower settings (I say easy, when even now I still seem to be missing shots from six yards even with the likes of Messi and Ronaldo), but the better the opponent the tighter the matches will be, and tougher to score that important winner. In matches, the game also looks better than ever before, with this possibly being the best I 've seen a PES game look in a long time. Obviously lacking in official stadiums and teams to take advantage of that is a shame, but it certainly doesn't take away from what is easily the best PES game in a long time. Online plays really well too in terms of connection, with the bunch of games I've played so far, I'm still to find myself moaning at one game having any sort of lag in it. Overall: Longtime PES fans will get more of what they love in PES 2018, but for the FIFA guy looking in, the game still has a few things to fix before it will drag you away from the much more polished and overall experiences your game will offer you. On the pitch, I would say PES has been the more enjoyable football game the last few releases, but licences and just dated menus once again stop it from being the must-own football game this year.